This wine had a lovely and very light burgundy colour and is still a young looking wine, this was reflected in the nose with its hints of light cherry a bit of indian spices and a touch of brightness. The fruit and acidity followed onto the palate making for an easy to drink light summer Pinot Noir. The really interesting thing was how it developed beautifully over the next 2 days, gaining a savory complexity and a slightly earthy taste which gave it a lot more body and helped flesh it out a bit more than when first opened. 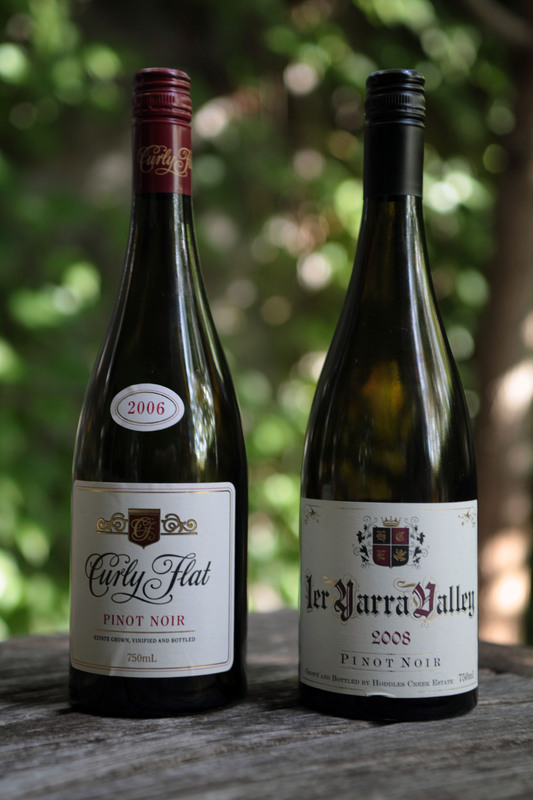 A fine example of a Yarra Valley Pinot Noir and at $50.00 this is a wine that is not over the top in price, fair value. It’s a Pinot Noir, it’s from Victoria so when I say something completely different it may just be a slight exaggeration but the segue sounds good and they are quite different in style and very different in how they both developed over the few days that they were consumed. This was a lot darker in the glass and showed more age than the Hoddles Creek, as it should with 2 more years in the bottle. The savory and spicy nose was well-balanced by the darker fruits and these flavours were on the palate from the start, the surprising thing is they didn’t develop a more aged musky profile over the 3 days it took to drink. If anything the wine become lighter in flavours! Not a bad thing but not what I was expecting at all, but then that’s a good reason to drink wine, it can always surprise. This is another good example of Pinot Noir, this time from the Macedon Ranges in Victoria. Purchased 12 bottles from the winery direct about 3 – 4 years ago @ $46.00 a bottle there are now 7 left in the Wine Room. Just purchased another 3 bottles each of the 2007, 2008, 2008 and 2010 vintages giving me a rather nice vertical of this wine. Glad to see you back blogging!